Traditional crafts and art on canal barges, written by our volunteer Janet. Roses and castles is the colourful canal art used to decorate working narrowboats in the 19th century, and it covered virtually everything in or on the narrowboat: the drinking can, the horse’s harness, doors, fitted furniture, lamps, anything and everything was decorated with bright and cheerful designs. The roses and castles movement started at a time when other traditional crafts and trades were being replaced by mass production, and it is still going strong today. No-one knows exactly where the movement originated from. 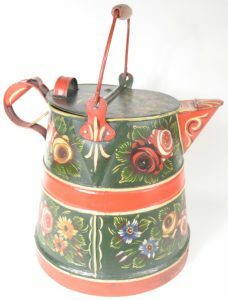 There are links with gypsy culture and folk art from Germany, Holland and even Asia. Money was short for the boatmen, especially once the railways were being built and replacing canal transport, and it made sense for them to bring their families on board to work the boat in the place of a crew. The bright and beautiful decoration was a sign of pride for people working on the canals and each artist had their own distinct designs. Foxton Locks, near Market Harborough, is the largest flight of staircase locks on the English canal system, with ten locks and side ponds on a hill. This allows canal boats to travel up and down the hill. Building work on the locks started in 1810 and took four years to complete and nothing really changed until the building of the inclined plane in 1900, which was a lift for wider boats. While this was in operation the locks themselves were not maintained and fell into decline. 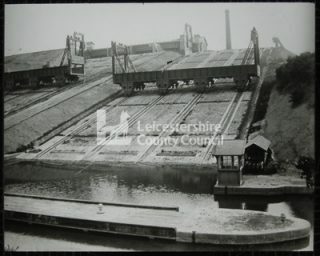 However in 1908 the canal committee donated £1,000 of its money towards renovation of the locks and eventually bought back them into full operation. The perfect way to see how this engineering marvel worked, is to visit Foxton Locks. There is plenty to do, including going for walks, enjoying the countryside and getting some food. Find out more here. Originally, this building was home to the boiler and mechanical workings that powered transporting barge containers up and down the inclined plane lift. The museum shows not only how it all worked, but also brings to life what it was like to live and work on the canals and locks of the Victorian waterways. Visit the museum’s website to find out more.